Following on from my previous post, I thought I'd do another "solution" to a feature missing from Microsoft Teams that I used in Slack. Reminders. In Slack, it was possible to set reminders within channels which Slack would remind you (or the channel) about at a given time. These reminders could be as simple as "remind @channel at 1pm to go to the meeting" or as complex as "remind @channel at 9am every weekday to go to standup". This feature is unfortunately missing from Teams, with no bots available to fill the gap and nothing but a feature request to hold our breath on. 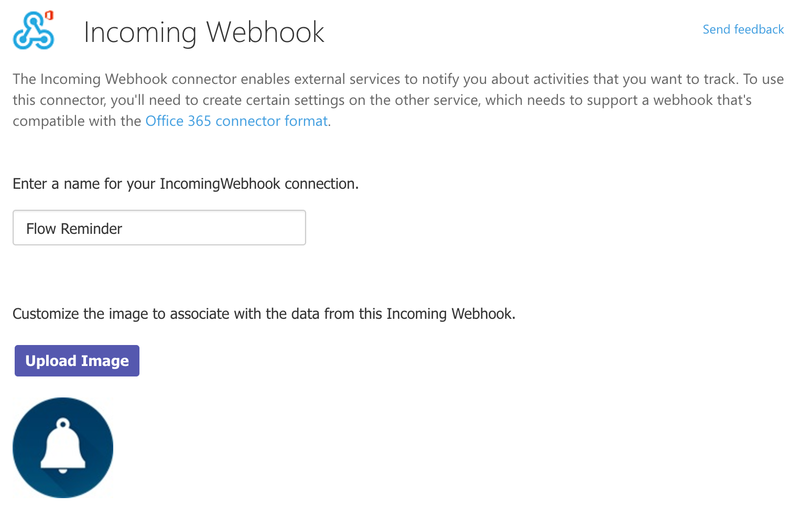 While we wait however, we can use Microsoft Flow to fill the gap. This tutorial will look into setting up a reminder; both simple and complicated. I'll be assuming that you know the basics of creating a flow, so lets get started by logging into Flow and select "Create from blank". Our flow will start off by setting up our schedule. This is achieved via the Schedule - Recurrence trigger. From here we setup our Frequency and Interval, which will be used to determine how often you want the reminder to go off. For instance, if you wanted the reminder to go off once a week, then you would set the Frequency to "Day" and Interval to "7" (i.e. every 7 days). In order to determine the day/time in which the reminder will go off, we'll need to look at the advanced options. From here, we can setup a start date from when the reminder should start. This will also be the point in which our interval will initially be counted from. So if we wanted to have our reminder go off every Friday at 1pm, then our Start Time would be set to "2017-06-02T14:00:00". Note that you should adjust this to a date that falls on a Friday in the future, or the flow will never trigger :) You'll also want to setup a time zone to ensure it triggers based on your local time. For me, this is GMT (or UTC+0). Your trigger should look like the following. Our recurrence is fine if you want your reminder going off once a week or every day, but what if you wanted something more complicated? Something like our example where we want it every week day. In Flow, this is achieved via conditions. To achieve this we'll need two conditions to make sure the day of the reminder is between Monday and Friday, which will need to be entered in advanced mode. The first condition should look like the following. This condition is passing the current date/time into a function which returns the day of the week in the form of a number. 0 is Sunday, 1 is Monday all the way to Saturday which is 6. We are wanting this number to be greater than zero (Sunday), therefore starting on Monday. Once our Flow trigger goes off (and our conditions, if set up, are met), we'll want to compose our message to send a nicely formatted message to Teams. This can be done by adding an action following on from our trigger called Data Operations - Compose. Within the input field, we can then compose the message we want to send. This can include any supported markdown to create a formatted message (e.g. bold text). Because of these problems, we're going to send our data to an incoming web hook made in Teams. 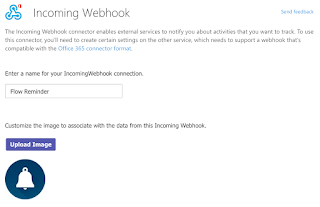 Therefore, go to Teams and setup an incoming webhook. I like to give it a bit of style and therefore I've called it Flow Reminder with an alarm icon to make it stand out when posting. As you can see, we're using Dynamic Content with our body. Dynamic Content are pieces of data that are generated as our Flow progresses and is based upon our previous triggers and actions and can be used in conjunction with fixed text. These are available in an overlay to the right of the action. They're added simply by tapping the relevant label. Once complete give the Flow a name and save it. It's now ready to start sending you reminders in Teams. If you can't wait for the time to arrive, you can always run it manually.